The World Summit on the Information Society (WSIS) Forum 2015 was held in ITU and WIPO Headquarters, Geneva, between 25 and 29 May 2015. 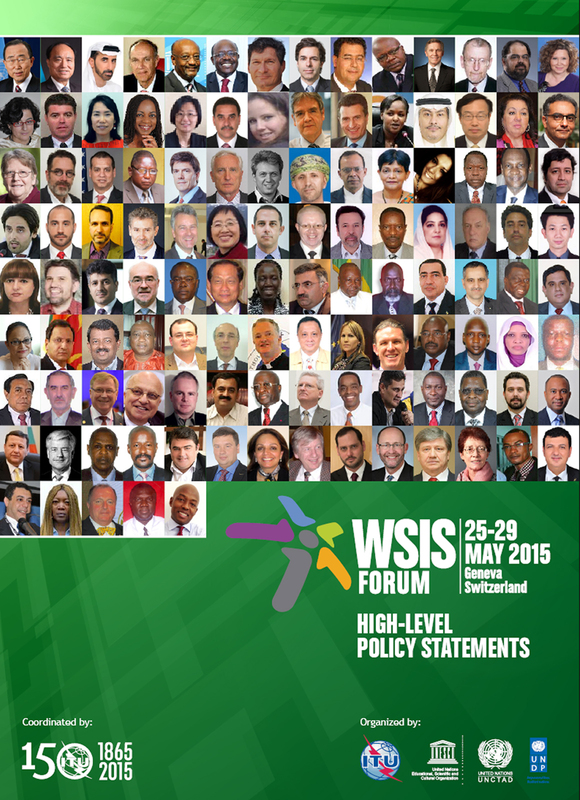 The overall theme of the WSIS Forum 2015 was Innovating Together: Enabling ICTs for Sustainable Development. Policy Statements were delivered during the High-Level Track of the Forum (26–27 May) by high-ranking officials of the wider WSIS Stakeholder community, representing the Government, Private Sector, Civil Society, Academia and International Organizations to express their views and report on the achievements, challenges and recommendations on the implementation of WSIS Action Lines, emerging trends, innovation and matters of strategic importance to the development of the telecommunication and information and communication technology sector. The list of High-Level Speakers and the statements delivered are posted below and are also available in the High-Level Policy Statements Booklet.